We’ve talked about some of the basics writers need to keep in mind around tax time, but the best thing you can do to help your taxes is to set your writing up as a business. You’ll avoid some of the trickier bits altogether, like whether your writing is a hobby or a business and whether you can take certain deductions. When starting a business, the first thing you need to do is choose a structure. For most independent writers, sole proprietorship is the way to go. 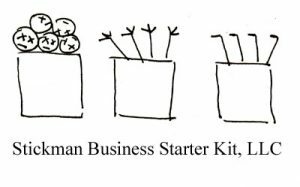 This is the simplest business structure: it has a single owner (you) and no extra forms or filings to fill out each year. You report all the income right on your regular personal tax return. The downside is that you’re liable for anything that happens with the business, good or bad. An alternative that offers a little more protection—but also requires more work—is the LLC. The limited liability corporation can have several members or just you, and it offers certain tax protections for your personal assets. However, it also requires you to file some forms both you start the business and each year of operation, and it often requires the payment of an annual fee to your state. To choose which is right for you, consulting a lawyer or tax advisor with small-business experience is the best way to go. You can also check your state’s tax website for information on how to set up a sole proprietorship or LLC. Once you have a structure and filled out the required paperwork, you’ll need to figure out where you’re going to work. Most professional writers use some variation of a home office. In order to deduct this on your taxes, you’ll need to use the area exclusively for work—no claiming the dining room table, sadly! If you can set aside a spare bedroom for work and only for work, you can then deduct a proportional amount of your mortgage or rent, taxes, utilities, etc., come tax time. If you can’t devote part of your living area to work, you might want to look into coworking spaces. These shared facilities let you pay a fee, either “drop-in” or monthly, to get access to a certain type of space in the coworking area. That fee is then tax deductible. You might get your choice of “free desks” or pay a little extra for a desk reserved just for you. These shared offices have the bonus of letting you be around other people—a must for staying sane as a freelancer—while also offering copy machines, Internet, coffee, and other perks. Once you’ve established your official business and gotten set up in your work space, you’ll want to keep track of all your business-related spending. Unlike “hobby” writers, who can only take deductions up to the amount they brought in from their writing in a given year, professional writers can take deductions against any other income, including that from a day job. In other words, you can “offset” your day job salary with deductions from your writing business to lower your overall taxes. Pretty great, right? But to do this, you have to keep great records. Every time you spend money on your business, keep the receipt (either in a paper file or by scanning and recording it on your computer). At the end of the tax year, you can sort these expenses by category and deduct them on your taxes. Examples of allowed expenses are things like a new computer you use only for work, a piece of software you’ve used to write with, plane tickets for a research trip for your next book, conference fees, printer ink, paper, postage, and more. If you take amazing notes and keep perfect records, possibly using a tool like Quickbooks or Mint, you can get away with mixing your money, which is depositing your writing income into the same account you use for everything else. (A safer way to do it is to set up a separate business account.) Most banks will allow you to have a few different checking and savings accounts and will even let you link them for easy deposits. Services like Mint, Wave, and Bench Accounting can link to your business account and help you keep track of income, expenses, invoices, and more. You can then pay yourself by moving money from your writing business account over to your personal account, marking the payment appropriately in your accounting software. When tax time rolls around, you just ask the software to give you an income statement for the previous year, and it’ll give you a breakdown of your income, expenses, and withdrawals. Often, it’ll even break down those expenses into the IRS’s preferred categories for easy entry on your tax return. So let’s break it down. What does it take to set up a professional writing business? At the most basic, you’ll need a formal business structure (probably a sole proprietorship), an official place to work, really good record keeping, and a way to separate your various income sources for easy reference at tax time. Of course, the most important part of any writing business is writing regularly and writing well. For help with that, call on the experts at Proofreading Pal to edit your next project.